Summer is the off-season for many high-altitude mountain towns, but some ski resorts are finding ways to capitalize on ski hill terrain year round. Ski hills are perfect for mountain bike parks, which include trail networks and man-made features that make flying down the mountain on two wheels an absolute blast. That's the primary difference between the singletrack you'll find in the woods and downhill bike parks - long downhill slopes, purpose-built features, and trails designed around them. 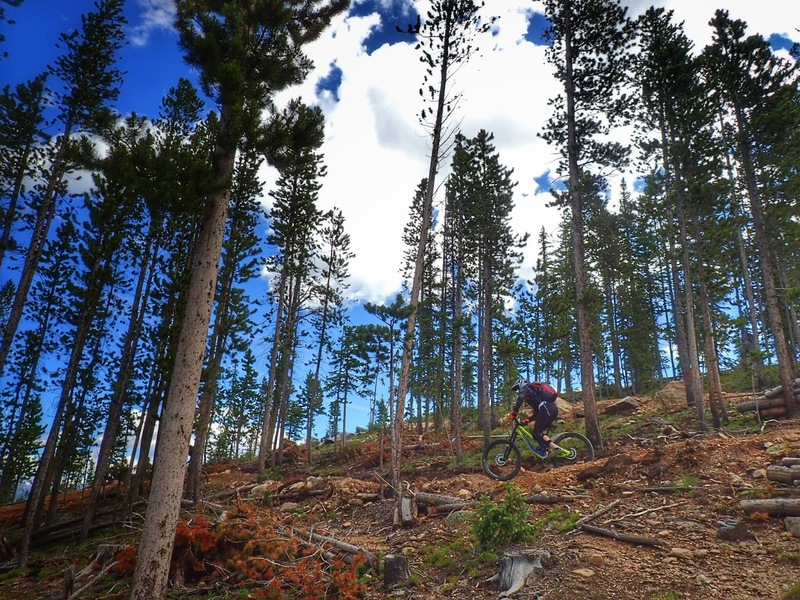 Winter Park, Colorado's Trestle Bike Park is North America's fastest growing bike park, and it's also home to the Colorado Freeride Festival. There, you'll find trails rated the same way ski runs are - green, blue, black, and double black - and instead of climbing up the mountain under your own power, you get to take a chairlift to the top. 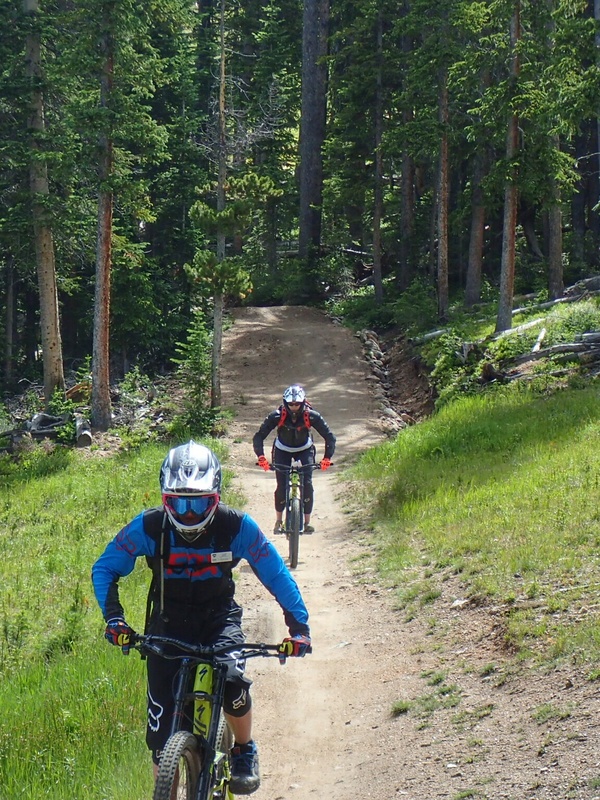 You'll also find skilled instructors for newbies and experienced riders alike (highly recommended), high end downhill bike rental packages, and over 40 miles of trails to explore. Trestle opened on June 15th this year, and on a recent trip, I got to see what downhill biking on flow trails is all about. Boy did I learn a thing or two. 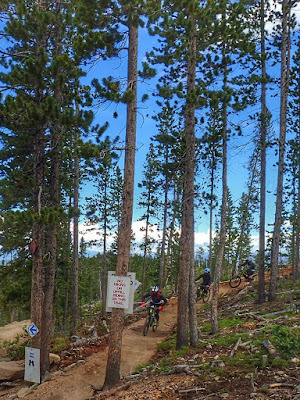 Getting the bike on the chairlift might be the hardest thing you do. Line your front tire up with one of the gutters, lift the handlebars, push the bike forward, let the front wheel sink into the deepest part of the gutter, get the back tire on, and you're good to go. Easy, right? Not so much. Just like getting on and off the chairlift your first few times skiing or snowboarding, it can be a challenge to do it gracefully. At Trestle, every third chair on the chairlifts was retrofitted with attachments that held three bikes at a time. I had a few chances to practice on flat ground before we went to try the real thing. Unsurprisingly, getting the front tire loaded into a gutter on a moving chairlift was significantly more challenging than doing it at my own pace on the ground. Luckily, I was able to do it each time, but there were a few close calls. The ideal downhill biking body position might surprise you. It sure surprised me. After spending all of my two-wheeled time on cross country mountain bike trails, much of what I learned during the first part of my downhill lesson was new. Rather than keeping the balls of my feet on the pedals like I'd do on a cross country bike or road bike, I had to work on keeping my foot centered on the pedal. It helped keep my calves from getting too tired while I was standing up, and helped me keep control of my center of gravity. Standing up? Yep. Standing up with your pedals level is what you're doing the majority of the time you're on a downhill bike. The seats are set much lower than on a cross country bike, which gives you more room to move around. More room to move around means responding to the terrain is easier, and your legs can act as springs along with the bike's suspension. I also had to be reminded to keep my elbows high. It looks better in photos, but more importantly, keeping your arms bent and elbows high gives you more stability on the bike. It's also generally a strong position. My Trestle 200 instructor leading me down the mountain. Look at what's ahead of you and let the bike do most of the work. One of the most helpful tips I got when coming into what were initially incredibly intimidating banking turns, or berms, was to look at the end of the turn. Somehow, that kept me on course, even though I had no idea what I was riding over. On our last ride of the day, Mountain Bike for Her founder Teresa and I took a trail down the mountain (Jury Duty) that involved a long, elevated wood bridge section that ended with a wall ride, and the only thing that kept me from all out panic was to keep my eyes focused on where I wanted to go. In addition to staying focused on where you're headed rather than where you are, avert your eyes from where you don't want to go. The last thing you want to do is to look at a rock, root, tree, or other obstacle you're trying to avoid. In general, where you look is where the bike goes, and I learned the hard way one too many times not to look at things I didn't want to hit on a cross country mountain bike. The same is true for downhill. And the best thing about downhill bikes is that they're made to take a beating. Though the Specialized Demo 8 downhill bikes we rode at Trestle cost more than my first car, I felt like I could ride over just about anything on it. The bike was forgiving, and with eight inches of travel, it took rocks and roots like a champ. Downhill mountain biking is a serious workout. When I couldn't figure out why my legs were so tired during our lunch break, I remembered something my Trestle 200 instructor said early on in the day. "If your legs get tired, stand up higher and straighten your them out. Vary your stance when you can. You're basically doing a squat for five hours." And he wasn't kidding. My quads felt like jello, my calves were burning, and my forearms were starting to cramp by the end of the day. Teresa helped me adjust my hand position to ease the tension in my wrists and forearms, but I could feel my core muscles working to keep me stable and upright with every bump, table top, and turn. Even if you're not pedaling, make no mistake - you're working hard on a downhill bike. When you're nervous on the bike, you're more likely to fall short of making it up the front end of a tabletop or around a berm, or brake suddenly and find yourself flying over the handlebars. Unless you're an adrenaline junkie, flying downhill on two wheels can be pretty scary. But the more anxiety you have, the harder it's going to be. I speak from experience. On my first run, I held on to the brake levers with three fingers when I'd been instructed to use one. I gripped the handlebars for dear life instead of letting my body and the bike flow with the terrain. And I squeezed the seat with my thighs every time I went around a corner rather than keeping my knees out for stability. I can't say I rid myself of all of those behaviors over the course of the day, but once I started to relax, I got much better at taking turns, handling drops, and getting over tabletops without causing a traffic jam behind me. I also had a lot more fun. If you've been downhill biking before, what other tips would you add? Do any of these newbie lessons sound familiar to you? 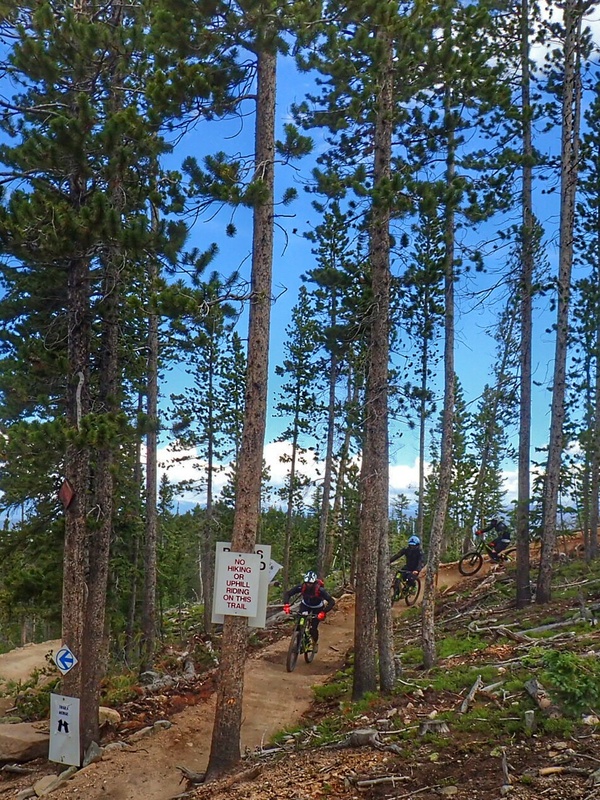 And be sure to check out what not to do at the bike park on the Liftopia blog. And for tips on mountain biking in general, check out this piece by the folks at Folding Bike Zone. My visit to Winter Park, Colorado and my experience at Trestle Bike Park was complimentary, but as always, the views expressed here are my own. Great information! Makes me miss CO. This looks so fun! I would love to give mountain biking a go! You don't need a bike park to give mountain biking a go, but there's something extra fun about downhill! Let me know if you end up trying it! Thanks, Ashley! I miss it too, and I was only there for four days this time. Such an amazing place! I've been wanting to try downhill biking but am so nervous about the chairlift part! Thanks for the tips! It's so funny, Lindsey, I didn't even THINK about the chairlift being something I'd have to worry about, and as it turned out, it was the hardest thing I did! I was good by the end of the morning though, a few runs and you'll have it down pat. I love downhill mountain biking. 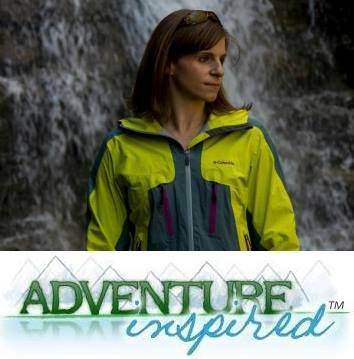 My favorite place to go so far is Mammoth Mountain in California, but I'd love to try in Colorado some day.